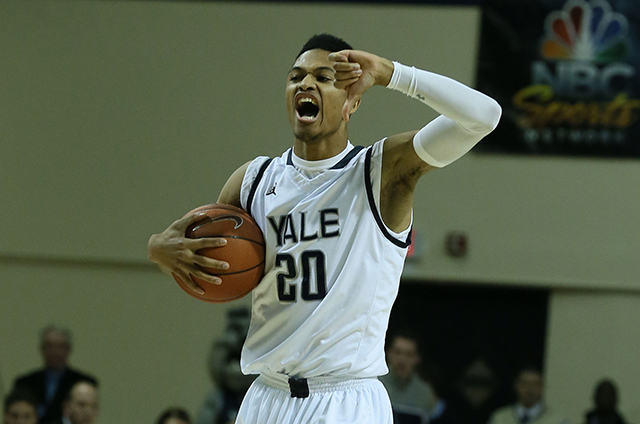 Yale had its first NCAA tournament berth in 53 years in its grasp. And then it slipped away. Leading 57-52 with 24.1 seconds left and having trailed for just 43 seconds of the entire game up to that point, the Bulldogs collapsed. Freshman guard Miles Wright hit two free throws for Dartmouth and added a three-pointer that tied the game. A 1-for-2 trip to the charity stripe for Yale senior guard Javier Duren gave the Elis a 58-57 edge with 2.3 seconds left, and Dartmouth had to go the length of the court in that span. But the Dartmouth cross-court pass was batted out by Yale junior forward Justin Sears, who inexplicably and purposefully batted the ball out of bounds, hoping to take more time off the clock. As a result, the Big Green got the ball under Yale’s basket, where senior forward Gabas Maldunas used a screen from junior guard Alex Mitola to get free for the game-winning layup, clinching Dartmouth’s first postseason appearance since 1959. Wow. Just wow. Brown raced to a 14-0 lead and seemed to have the win secured with a 50-26 lead and 13:58 remaining. Not so. The Big Green finished the game on a 49-19 run, aided by three Brown technical fouls and a 17-point effort from last week’s Ivy Co-Player of the Week Malik Gill. Just a week after Brown overcame a 40-23 deficit to trump Cornell, a comeback got the best of the Bears this time around. Dartmouth, which went on a 26-2 run en route to a win at Harvard earlier this season, now awaits Yale, which had a little success of its own at Lavietes Pavilion and needs the win to clinch its first outright Ivy crown and NCAA tournament berth since 1962. Of course, a win over Yale launched the Big Green into the postseason (in this case, the CIT) for the first time since 1959, so Dartmouth has already won the drought game. As Penn coach Jerome Allen pointed out after the game, Columbia scored 46 in the first half against Penn a month ago en route to an 83-56 romp. Tonight, it took the Lions the entire game to reach that total. Junior guard Tony Hicks led the way for Penn, posting 19 points and eight boards, helping Penn snap a seven-game losing streak. The Tigers’ 23 bench points and 15-point performance from senior guard Clay Wilson lifted Princeton past the Big Red, which shot just 37.5 percent in spite of senior forward Shonn Miller, who posted 25 points. And of course, sophomore forward Spencer Weisz notched 10 points, the 10th straight game Princeton has won when Weisz scores in double figures. Shonn Miller has been rendered a free agent with one year of eligibility left due to Ivy League rules on graduate students. Senior forward and All-Ivy first-team shoo-in Shonn Miller is being forced to wind down his career with Cornell. Because the Ivy League prohibits the participation of graduate students and Miller missed last season following shoulder surgery, Miller still has a year of eligibility remaining but cannot use it at Cornell. The visiting Tigers jumped out to a 12-2 advantage and never looked back, leading by 26 at one point and outplaying the Bears in every facet of the game. Steven Cook’s 15 points and seven boards set the pace for Princeton, as did 12-point efforts from Henry Caruso and Amir Bell. The Tigers are now just a game under .500 at 13-14 and still claim a distant third place in the Ivy standings. Tavon Blackmon curiously logged just five minutes despite no fouls and no obvious injuries. Nothing makes sense for Brown fans anymore. Robert Hatter exploded for 23 points for the Big Red but the Big Green won the battle of the Bigs behind 41 combined points from Alex Mitola, Gabas Maldunas and Malik Gill off the bench. Dartmouth shot 7-for-15 from beyond the arc and wondered what Harvard found so hard about completing the Empire State sweep. Things got real interesting in New Haven. The Quakers led for the first 37:41 of the game but couldn’t hang on late, with Justin Sears overcoming seven turnovers to notch a crucial block and three-point play in the game’s final minute. The Bulldogs get to 10-2 in Ivy play and will travel to Harvard next Friday for the game of the year. Javier Duren posted 19 points but shot just 4-for-15 from the field and was outshone by Antonio Woods, who scored 14 and added six assists in a losing effort. True to form, Jack Montague nailed two clutch threes down the stretch and finished with 11 points of his own. And it’s the game of the year largely because Harvard won too, also climbing to 10-2 to keep pace with Yale atop the conference standings. Wesley Saunders posted 21 points, including 11 free throws, to lead the way for the Crimson, and Steve Moundou-Missi added 17 on 8-for-11 shooting. Host Columbia shot north of 53 percent for the second time against Harvard this season, but it came up with a second loss because the Lions just couldn’t get anyone going outside of Maodo Lo, whose 33-point, five-steal performance just wasn’t quite enough, even as the Lions cut Harvard’s lead to 48-44 with 11:54 remaining. The Lions have depth issues, but they do have Alex Rosenberg and Grant Mullins coming back – next season. After Harvard edged Yale 52-50 in New Haven, needed a game-winning Siyani Chambers jumper to survive a second-half offensive drought against Columbia and struggled early against Princeton, it was clear the Crimson needed to shore up their offense. But it makes sense that that wouldn’t happen against a Cornell defense whose calling cards are its physicality and length. Wesley Saunders and Siyani Chambers combined to shoot just 9-for-31 as the Crimson struggled to establish any offensive rhythm whatsoever in a 57-49 loss to the Big Red that dropped Harvard to a 9-2 Ivy mark and first-place tie with Yale atop the league standings. Harvard shot a paltry 25 percent from the field as a team, out-Cornelling Cornell in the process. Now Harvard heads to Levien Gym, where it needed overtime to pull out a controversial 88-84 victory last season and lost 78-63 the year before. Will the Crimson go winless on the Empire State trip? We’re about to find out. Well, then. The Big Red raced to a 22-21 halftime lead and out-Crimsoned the Crimson in the second half, pulling away with stout defense and efficient shooting. Shonn Miller fired on all cylinders to the tune of 24 points, 15 boards and three blocks. In a season in which Miller has consistently struggled beyond the arc, a pair of Miller treys midway through the second stanza signaled this wasn’t Harvard’s night. The Big Red’s win snaps their nine-game losing streak against Harvard as well as the Crimson’s 12-game win streak in Ivy road games, dropping Harvard to 4-7 at home this season. Most importantly, the loss drops the Crimson to 9-2 in Ivy play. The Justin Sears Show (feat. Javier Duren) overpowered Princeton’s ensemble performance down the stretch and the Bulldogs ended the game on a 42-13 run to tie Harvard atop the league standings at 9-2. Sears notched 12 rebounds and 28 points, giving him 53 in two wins over Princeton this season. Princeton was randomly led in scoring this evening by Steven Cook (12) and Clay Wilson (11), marking the first time that pair led the Tigers in scoring since Mitch Henderson’s squad trumped Stony Brook in December. Brown completed its second consecutive season sweep of Penn thanks to a 21-point, 6-for-9 shooting (all beyond the arc) performance from J.R. Hobbie, who shredded Penn’s perimeter defense for a second time this season after having also scored 21 at Penn earlier this month, both season highs. Penn’s Tony Hicks returned from a two-game suspension for poor sportsmanship in a loss to Brown and in his failed attempt to exact revenge on the Bears notched 23 points, five rebounds and four steals. Penn has now lost six straight. Dartmouth pulled off a season sweep of its own against the Lions, pulling away in the second half on the strength of Alex Mitola’s 18 points and five other players in double figures. The Big Green shot 60 percent from the floor while Columbia made only nine of 34 three-point attempts, knocking Columbia down to 5-6 and a tie with Cornell for fourth place in Ivy play.